Are you among the millions of people who experience the need for reliable computer, television and multiple device connections at your home or office? Digital device connections are a necessity in this technological era. giving people the advantage of faster sharing of information through multiple inputs and output devices. As much as the HDMI cable has been able to achieve this, having an HDMI splitter gives users the ability to channel their digital productions or presentations to an even wider reach. 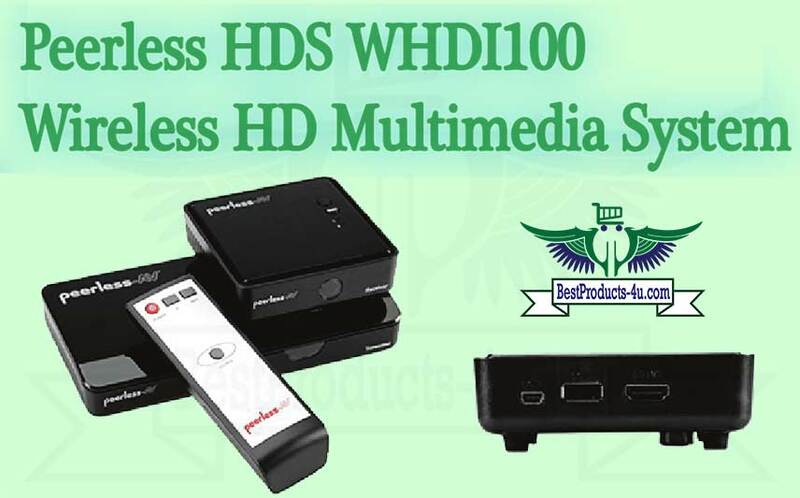 The HDSWHDI100 Peerless Wireless HD Multimedia System is an HDMI splitter that comes laden with the most reliable features that are designed to ensure seamless streaming of digital files to and from different digital appliances. The professional, entertainment and gaming industries, among others, upholds maximum quality when it comes to sharing of data and information digitally. With this high bar set regarding digital media, the Peerless Wireless HDSWHDI100 Multimedia System has the capabilities to stream up to 1080p videos thus great for high definition videos. Its capabilities span up to streaming of 3D videos, which makes this HDMI transmitter a necessity for garners and movie enthusiasts who use smart monitors with 3D capabilities regularly. This HDMI dongle allows for high-quality connections from your computer. set-top box. Blu-ray/DVD player or game console, to your HDTV, display monitor or projector. Two HDMI Ports and One USB Port. The Peerless Wireless HDMI splitter allows for connection of two HDMI source devices and one USB source device. Some of the devices that can be connected via the HDMI ports include your Blu-ray/DVD player, computer, set-top box, and gaming console, and up to two HDTVs. On the other hand, your gaming controller, mouse or keyboard can also be connected via its USB port. In addition to its connectivity all these peripherals, this HDMI splitter makes use of its HDMI pass-through feature to connect to another HDTV, projector or display monitor via the HDMI cable. This makes it possible for videos to be viewed on different screens simultaneously. In addition to the HDMI and USB connection, this device also allows for wireless streaming. Offering a range of 100 feet regarding streaming range, this multimedia system covers a wider radius for more reliable video and audio streaming. It also supports 5.1 -channel audio, thus offering both visual and auditory interaction. Featuring the Zero Latency feature of <1 ms, you will enjoy instant gaming console and computer response, hence ideal receptiveness and user interaction. For the sake of flawless streaming of videos, this multimedia system creates its 5GHz frequency network buffer zone to prevent interference from other surrounding waves, networks, and connections. This best HDMI splitter makes use of its enhanced IR functionality to make it compatible with all the source components connected to it. If you are using a set-top and a Blu-ray/DVD player, then you can use their original remote controls to control it via this HD multimedia system. Even though this system comes with its multifunctional remote control for switching it on or off and also changing the input from different source devices, you can achieve most of its functions using the remote controls of the source devices. It is versatile as it allows for multiple device connections. It ensures faster transmission of high definition and 3D videos. It offers uninterrupted streaming of video and audio, thanks to the 5GHz frequency network it creates around it. It can be controlled remotely using its remote control or those of other source devices. Its compatibility with other devices is to be applauded. It offers wireless. USB and HDMI connections, hence convenient to any user. It decreased by steel, concrete, wood or brick obstacles such as walls made of these materials. Its IR receiver cannot detect a signal is directed from behind the TV, unlike other high-end wireless multimedia systems. The Peerless Wireless Multimedia System possesses powerful features that make it the best wireless HDMI kit of its caliber. Its reliability, versatility and ultimate functionality cannot be ignored, especially with the pretty affordable price tag it bears. If you want to enjoy sharing videos, games and other digital data from one device to another, and on multiple display screens on a low budget, then this Peerless multimedia system should be your first choice. 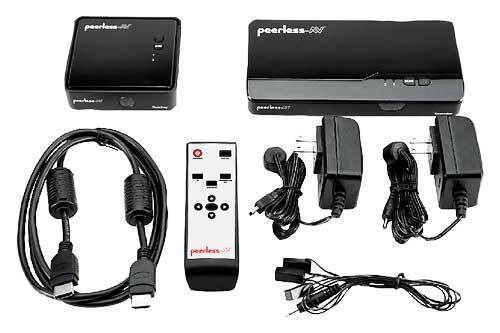 peerless-wireless-hdmi-media-kit	Overall rating:	5	out of 5 based on 2	reviews.